← Medvedev Putin Song and Dance Animation New Year 2010! Russia Gets Dunkin’ Donuts to Sweeten Her Tooth! 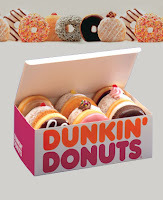 In Russia the American donut producer, Dunkin’ Donuts, has franchised its brand to a Russian company which plans to open ten locations this year (2010) in Moscow. Looks like Burger King is not the only company that sees money in the Russian financial system. The chain will be open in various formats, from full-fledged freestanding stores to attached mini-cafes and they say that the investment into each location is going to be around six million roubles each. Do you think that Russia is ready for Dunkin’ Donuts?